Guest post by Kim DeWolff via her blog Plasticized. 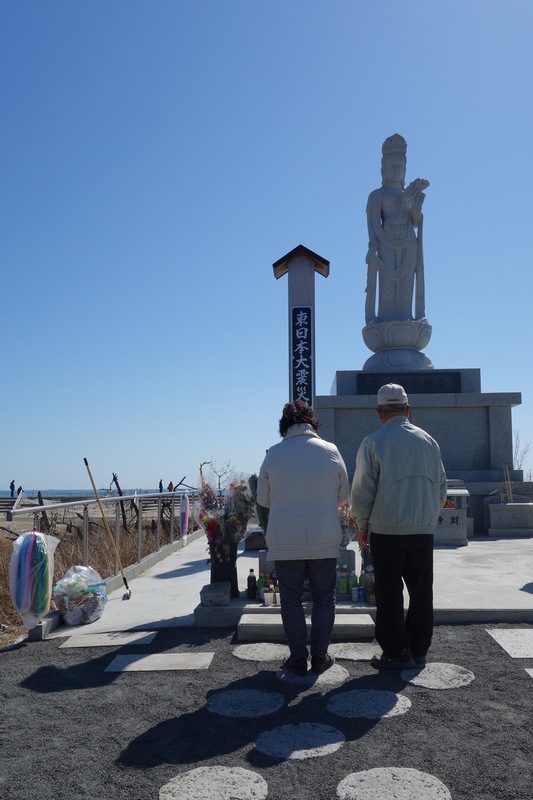 On a sunny spring morning we walk the Arahama coast near Sendai, the largest city in the Tohoku region that experienced the March 2011 tsunami. Two years and a few days later, yellowed grass stands in cracked concrete outlines of houses, bathroom tiles still recognizable. A team of green-shirted volunteers is hard at work near the river, and in the distance, smoke rises from an incinerator built specifically for disaster debris. A telephone pole lays in the sand near the concrete seawall lining this stretch of beach; remains of a metal roof rest bent and twisted in damaged trees. 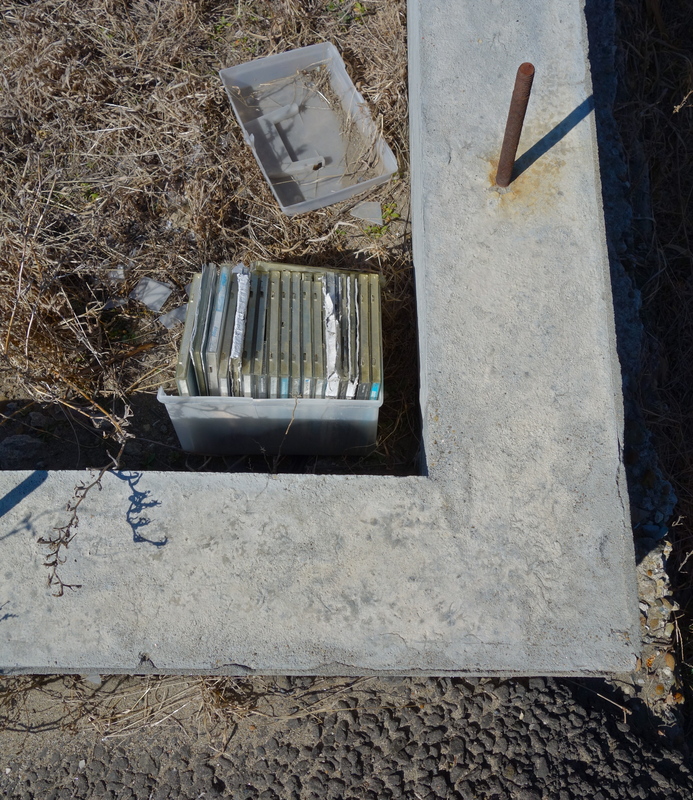 I never intended to study tsunami debris or write about disaster. 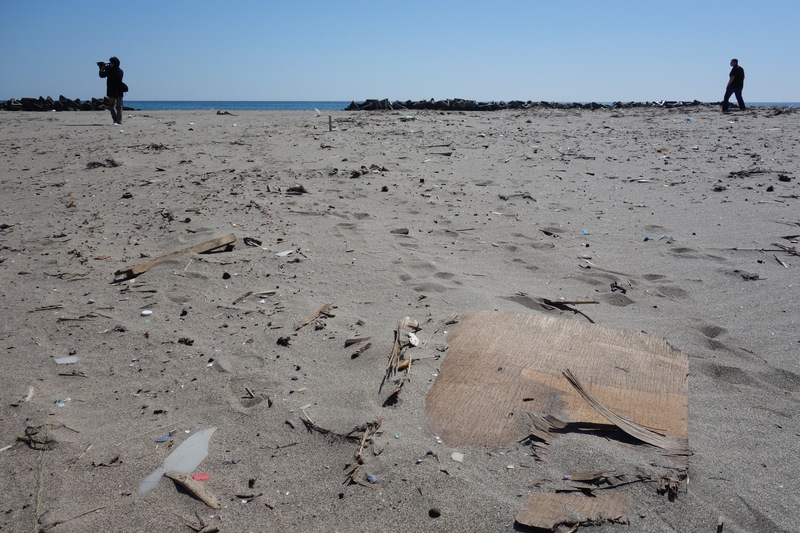 But I began fieldwork following marine debris in spring 2011, and plastic paths have led me across the Pacific to Japan where I am honored to attend a series of tsunami debris forums organized by the Japan Environmental Action Network (JEAN). The events bring beach cleanup coordinators from Hawaii, Alaska and Oregon together with coordinators in Japan and with those closest to the tsunami with the aim of fostering understanding and collaboration across the Pacific. Like the other participants, I have considerable experience looking for plastic on the shore, but today I walk a beach that does not feel like any I have visited before. The sand is windswept and free of footprints except for our own. Large debris has long since been cleaned up, but bits and fragments are scattered everywhere. Bottle caps. Broken glass. A cup half buried in the sand. Tattered scraps of wood and other building materials. These objects are at once familiar and strange, as mass produced and anonymous as items I have seen on other beaches, yet haunted by the conditions of their loss. Those who have careers cleaning up objects from beaches ask permission before touching anything. At the tide line I pause, staring down the horizon, thinking of California so many thousands of miles away yet connected by ocean currents and all kinds of crossings of people and things. The communities that lived nearby have constructed a memorial site with Buddhist statue and dark wall inscribed with names of those lost. A slow but steady stream of visitors brings small offerings: bottles of tea, flowers, strings of paper cranes. Small waves break in the distance, and the ocean air is laced with incense. I gaze up at the statue, backlit with a halo of morning sun, and try to imagine the clear blue sky as a wall of black water. 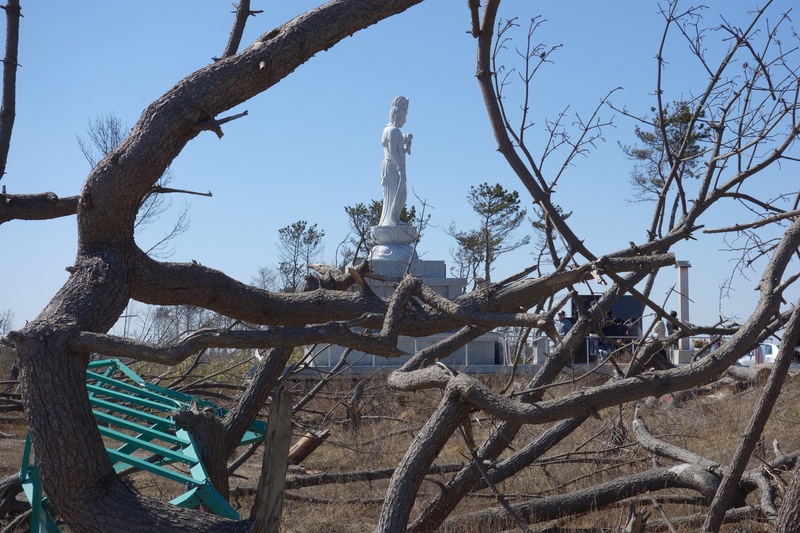 At seven meters (23 feet) tall, the statue is the same height as the largest wave that inundated this stretch of the coast. The material record echoes in the surrounding trees, stripped of branches and devoid of greenery to the same height. At the afternoon forum in Sendia’s busy city center, the guest coordinators give presentations showing the arrival of debris in the US. Many presenters emphasize how marine debris problems far predate and will long outlast tsunami debris. But they also detail local efforts to clean beaches, and the care taken to ensure volunteers treat found objects with respect. A succession of audience members express their gratitude and the hope that items can be brought back to Japan, reunited with their owners. There is a strong sense that these objects still belong to someone, that they are ‘pieces of lives,’ one speaker even comparing them to human remains. 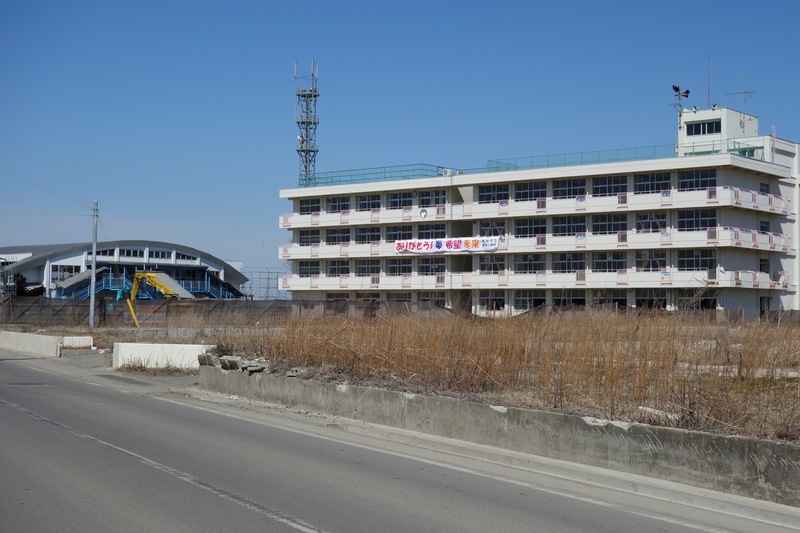 Like many people in Japan, they do not want tsunami debris treated as or even called debris. Speaking instead of ‘lost things’ or ‘personal items,’ they separate with words what they hope people cleaning the beaches of Hawaii and the West Coast of North America can separate in practice. 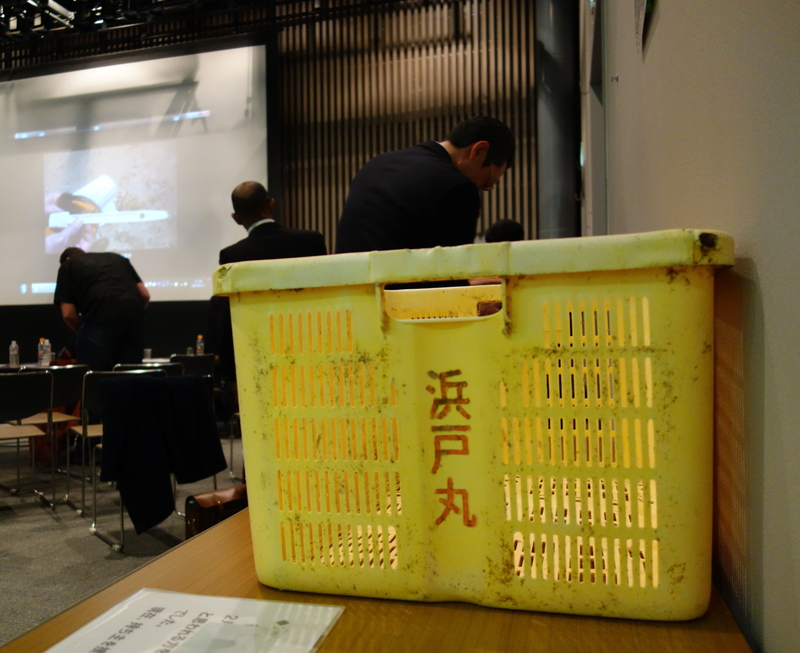 Near the end of the event, a speaker points to a yellow fish crate on a table at the side of the room. Lost in the tsunami, it floated to Alaska where it was identified as tsunami material and brought back to Japan with hopes of finding its owner. Word has just come that the owner of a soccer ball that traveled a similar path has finally been located. Though these anecdotes are uplifting, for many in the audience everyday life still means temporary housing and a continued struggle with uncertain futures. 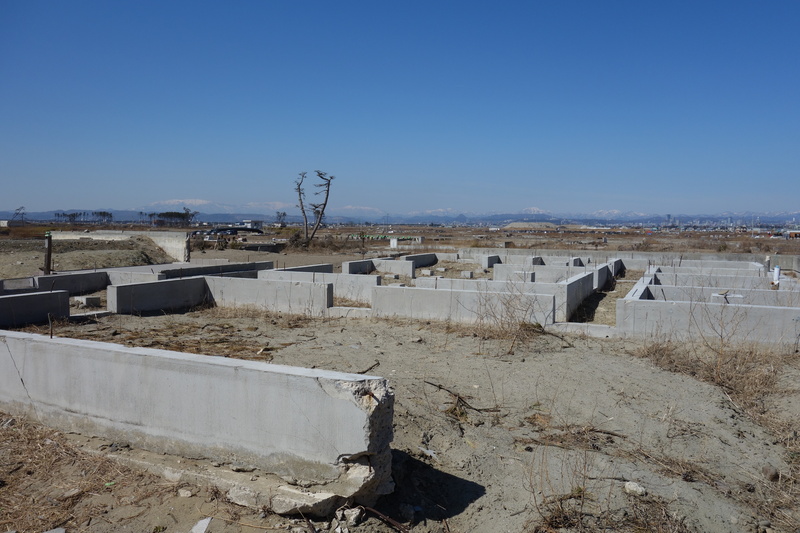 While most land has long been cleared, the government is not allowing residential rebuilding near the shore. Many people do not know when and if ever they can go back to their communities. 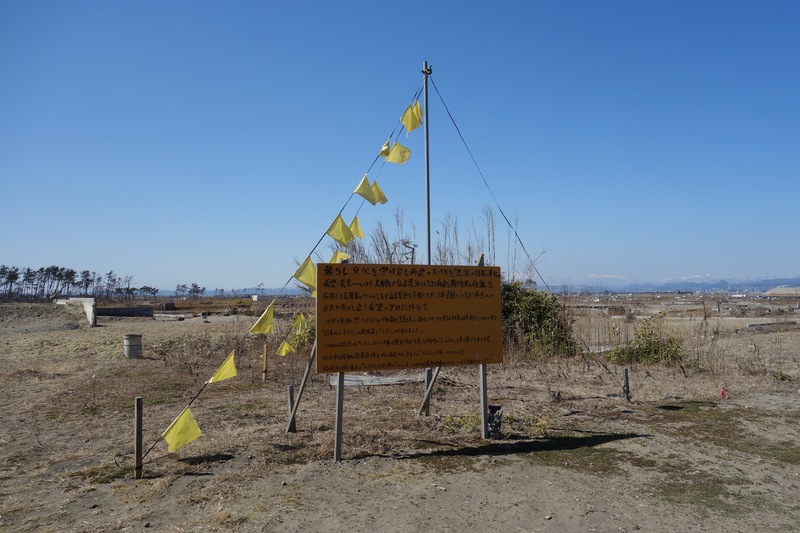 A hand-painted sign at the beach reads, “losing living from Arahama in Sendai is the same as losing history, culture, or even the same as losing our home.” Here ‘home’ is furusato, a Japanese word that carries the cultural politics of origins, linking local and national, nostalgia and future, lifestyle and landscape. Above, strands of yellow flags signal the hope of return. This entry was posted in Environment, history, World and tagged disaster debris, marine debris, memorial, memory, tsunami, waste. Bookmark the permalink.